The Del Fuvio Brothers are back; who I hear you say, well Mike Portnoy and Derek Sherinian, were given that name over twenty years ago during their short time they played together in Dream Theater. In fact, these two guys only played together on two DT albums, being: Falling Into Infinity (1997) and Once In A LIVEtime (1998) but they seemed to really hit it off musically, as they now come up with a new super group called Sons Of Apollo. And a super group it is, in fact that is a euphemism, as Sons Of Apollo, besides Portnoy and Sherinian, consists of one of the best bass players in the world Billy Sheehan (Mr.Big, Winery Dogs), super vocalist Jeff Scott Soto (ex-Malmsteen and ex- Journey) and the excellent guitar picker Ron Thal (ex- Guns N' Roses). So five more than excellent and gifted musicians release their debut album called Psychotic Symphony and without beating around the bush I would like to call this album one of the best prog metal albums I have heard in a long time; it certainly is the rock album of 2017 for me!! 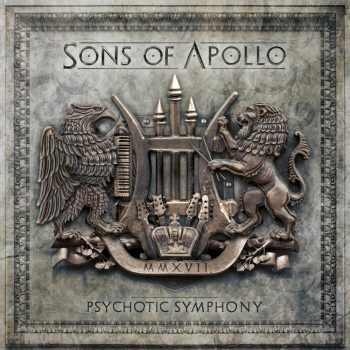 Psychotic Symphony contains eight songs and one very short instrumental interlude and all the tracks are a mix of the sounds of the bands these incredible players have performed or still perform in. So you get a brilliant blend of Dream Theater, Black Country Communion, Winery Dogs and Mr.Big; songs filled with power, musical virtuosity, diversity and I would even call this album a prog metal statement. The album kicks off with the longest track, a prog metal epic called God Of The Sun, clocking over 11 minutes and it is a perfect introduction to this amazing album; especially Soto's vocal performance, it is top notch here. Another epic on this album is the closing track, an instrumental prog metal monster like you have never heard before; this song has loads of aggression to boot and it is so complex that you need to listen to it several times to fully comprehend it. If you like your prog metal fast than Lost In Oblivion is a song you will like as here the speed mania is definitely back with a vengeance; check out the spectacular end of this track, a huge instrumental eruption. Alive is a ballad with sheer power, but it is also dark and heavy and features a colossal chorus, while Coming Home is blessed with a super riff and an extremely groovy melody. When I heard the first riffs of Divine Addiction I immediately thought: “Hello Deep Purple”, this is classic rock at its best and Divine Addiction also has an utterly infectious chorus.